It was because of water, Nye County brothel owner Dennis Hof said. 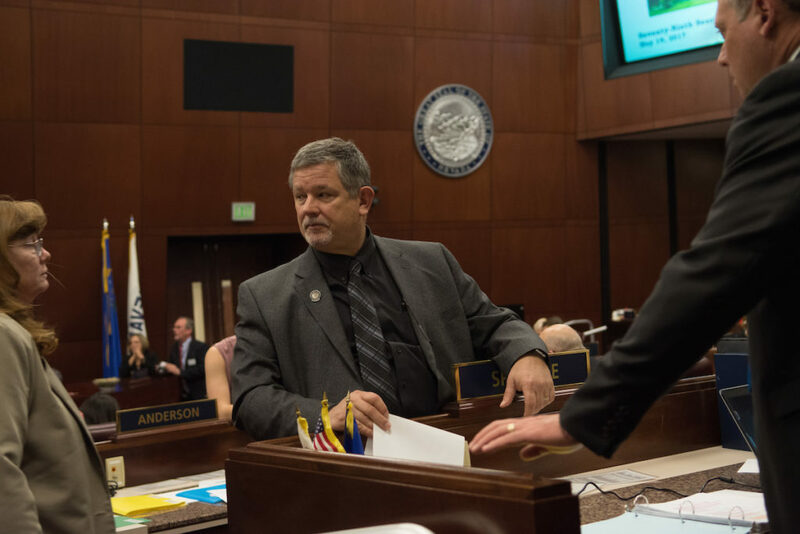 It was because of water that the county temporarily suspended one of his licenses earlier this year, Hof argued during an interview with The Nevada Independent. The county didn’t say it was because of water rights — the suspension was a result of unpermitted renovations — but Hof, who is running for the Assembly, says this with certainty: He was targeted because of his positions on water. “It all comes from the fact that I’m not part of the establishment. I’m not part of the pay-for-play. And I’m supporting the well owners more than I am the water rights holders,” Hof argued. Since 1990, Nye County’s population has more than doubled to about 43,000, and as with any growth in the Nevada desert, water rights are a sensitive topic. Nye County is one of the largest counties in the contiguous 48 states but the population is concentrated in Pahrump — an hour outside of Las Vegas — where any residents pump their water from a groundwater basin that captures mountain runoff. It’s there that the issue of water rights has boiled over in recent months. Like pulling a scab off a wound, Nevada’s top water regulator issued an order in December that put restrictions on new domestic wells. By Nevada statute, residents who do not have access to a public utility are allowed to drill one domestic well on their property, a personal straw giving them direct access to groundwater. They do not need a permit or any water right to drill a well. This results in an accounting problem for water management. It means that on top of existing water rights, some of which date back to the early 1900s, there are thousands of de facto, unmeasurable and unaccounted for claims from well-owners. Simply put, there are more claims to water than there is water in Pahrump. If all of the rights were being used, the basin could be over-pumping about three times what hydrologists say is sustainable. They are not. The average domestic well does not pump at its full capacity. Developers have set aside water rights each time they plan a subdivision. Many of the existing rights are held by the town’s private utilities, which could use that water for residential or commercial development. But the over-allocation problem remains. There are too many claims on the groundwater. And there are so many vacant lots in Pahrump that there are dozens of new claims every year. The state engineer’s office, which regulates water, attempted to halt new claims with its order in December. Under the order, new domestic well-owners are no longer able to drill without a water right to offset their use. It sounds simple enough, but in practice, the order has given way to a messy political fight over growth and water, pitting landowners with senior water rights against landowners without them, domestic well-owners against those who get their water delivered. Some have called the order, which makes it harder to drill a well, a “transfer of wealth.” They argue that it makes subdivisions more appealing, which could boost sales for developers. There is already a lawsuit, and the topic is so delicate that the local judges recused themselves. Back to Hof. As you might have guessed, he opposes the order. Hof, author of “American Pimp” and featured in the HBO series “Cathouse,” believes the political establishment, which he defines as his opponent Assemblyman James Oscarson and several county commissioners, are out to get him. “They are puppets for the water-rights people,” Hof said. “I’m a puppet to no one,” he added. In October last year, two months before the state engineer’s order, Melissa Campbell and her husband closed on a 4.7-acre lot in Pahrump, where they planned to raise their sons, nine months and five-years-old. They spent a portion of their savings on the land and they focused on saving up the thousands of dollars more — the cost to build a 200-foot well and a septic tank. “Order 1293 came first,” Campbell said. That threw a wrench into Campbell’s plans. The state engineer’s domestic well ruling requires landowners who want to drill a new domestic well to purchase two-acre feet, or about 650,000 gallons, of water rights. The idea is that those water rights would offset the pumping from the new domestic well. By offsetting use from new wells, the intended result is that no new water claims would be added to a basin where there are an unsustainable amount of claims to water. The problem: After the order came out, the price of water skyrocketed. “We are a family of four on an income of one,” Campbell said. From January to the time Campbell spoke to The Nevada Independent in March, she had been looking for affordable water rights to purchase. They are thousands of dollars. According to the county recorder’s office, Pahrump Valley water rights have gone for about $3,183 an acre-foot. Campbell said she saw an ad in the January issue of Pahrump Over The Hump, a classifieds and real estate magazine that’s given out for free at the town’s grocery stories and gas stations. It listed water rights for $6,000 an acre-foot. When she answered the advertiser in January, he said they had gone up to about $7,500 an acre-foot. “To me, this is a sick game,” she said. One deed, recorded with the county, showed rights going for about $10,000 an acre-foot. 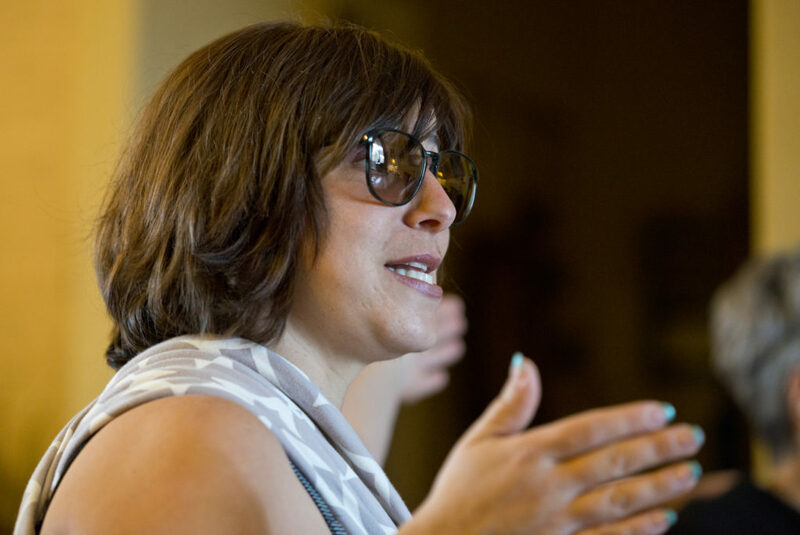 There are about five recent homeowners who are similarly situated, according to Norma Jean Opatik, Campbell’s real estate agent who is leading the group challenging the order in court. 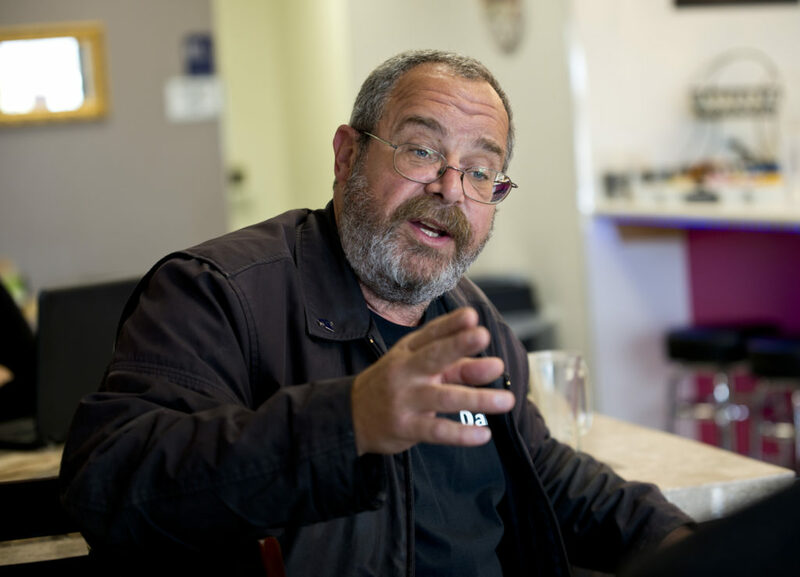 “People are taking advantage of the situation,” said Opatik, who was at the interview. In the meantime, Campbell has no water at the land she purchased. The family is renting a spot on a commercial property in a 30-foot trailer that is increasingly feeling less and less temporary. “It has been stressful on my family,” she said. Dan Schinhofen, the vice chairman of the County Commission and a domestic well-owner, said he generally supported the order but said that he shared concerns of residents like Campbell. There are more than 11,000 domestic wells in Pahrump, and each one can pump two acre-feet of water, or about 650,000 gallons, per year. The county expects, in the coming years, that there could be up to 7,500 more domestic wells constructed. The order does not affect existing wells. 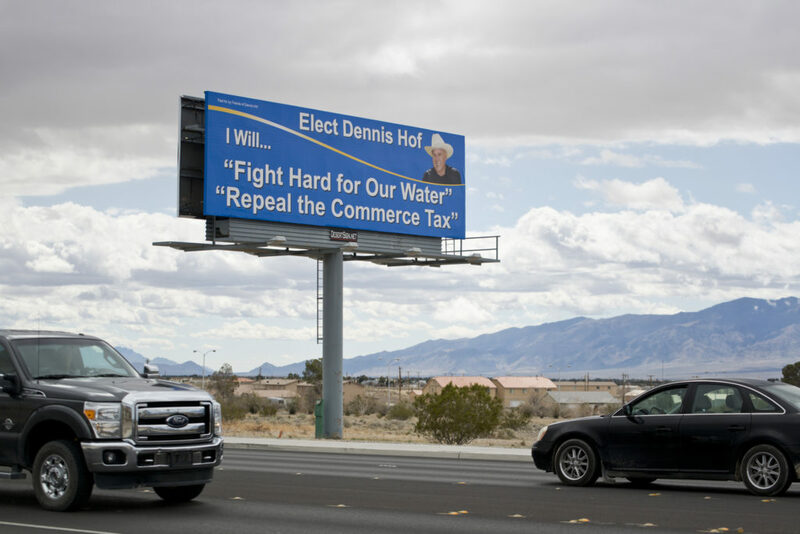 Dennis Hof’s fear about ulterior motives with water has echoes throughout the Pahrump Valley. In the West, where water is often more valuable than land, people keep a close watch on those who regulate it. Even when the regulations don’t affect them directly, there is a lot of fear around water, often for good reason. 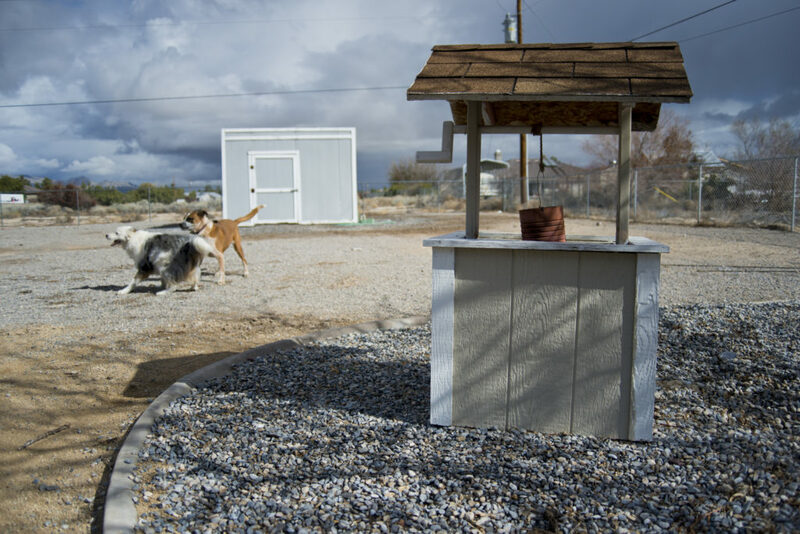 In Pahrump, the fear is that a regulator could put restrictions on existing wells. The state engineer’s office has been explicit that it does not want to do that. The state engineer’s order only affects new domestic wells, yet the “fear factor,” as Pahrump residents described it, is there. There is a vocal contingent of well owners in the valley who fear that restrictions on new wells will inevitably open the door for restrictions on their wells one day. In many ways, the order was a last resort. The state engineer tried to push legislation before last session to meter wells, but it received fierce pushback from well-owners who worried that it could restrict their usage. The idea was dropped. But residents in Pahrump even disagree about whether there is a water issue in the first place. Some residents said the state engineer is acting on hydrological data that skews the issue. The information war has trickled down into the political wrangling in an election year. 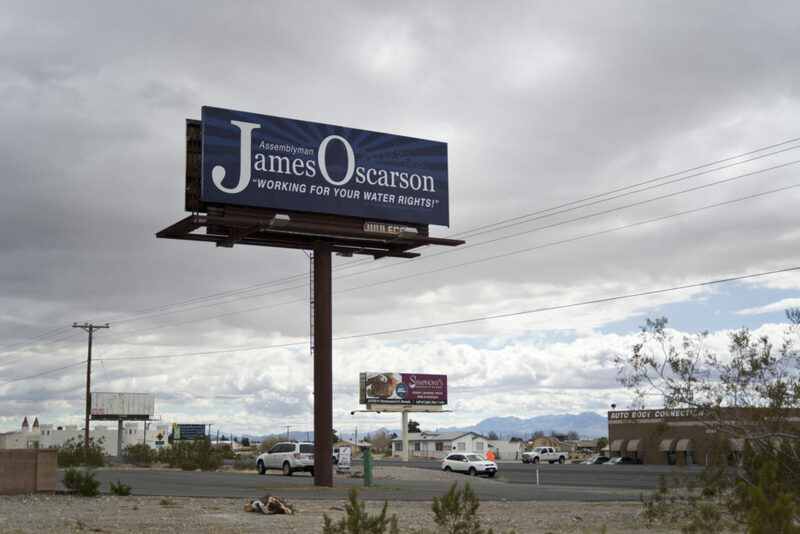 Oscarson said he has received well over 100 phone calls from constituents over the issue. He said he has tried to call the state engineer, Jason King, but had yet to hear back from him. “The guy won’t even give me a call back,” Oscarson said. Similarly, the group that is suing the state engineer — Pahrump Fair Water — slammed Attorney General Adam Laxalt, for defending the state engineer, according to the Pahrump Valley Times. The attorney general’s office pushed back against this, arguing that Laxalt, a Republican who is running for governor, would be shirking his responsibility if he were not to defend the agency. “The office of the Nevada Attorney General is statutorily required to represent the state engineer and defend the policy decision in order 1293. While litigation is pending, the attorney general cannot comment on the litigation or share his personal views about that policy decision,” Monica Moazez, the spokeswoman for the attorney general’s office, wrote in an emailed statement. On Feb. 1, Pahrump Fair Water asked the court to stay the state engineer’s order. The state engineer’s office responded to questions but declined an interview because of the pending litigation. He has argued that it is well within his authority to enforce the order that was drafted. It opposed the stay in court, and it could take some time to litigate. “The courts will decide whether [the state engineer] can do it or not,” Schinhofen said. Much of the vitriol directed toward the state is historical. In many ways, predecessors in the state engineer’s office helped create the problem by allowing the basin to be overallocated. Because of how Western water law is set up, fixing the issue is hard. And it’s something that will continue to be a source of conflict for the state engineer’s office in the years to come. The order is, in some ways, only a first step. It would ensure no additional claims are added to the basin. But it would not necessarily prevent pumping beyond what is sustainable. Even without the addition of new wells, there are more rights than there is water to keep the aquifer whole. Lach argued that they were targeted because domestic wells are the easiest usage area for the state engineer to control. Although homeowners have the right to drill a well, well-owners do not generally have paper water rights, like those owned by Hafen’s utility. Moreover, Hafen’s rights take priority over most domestic wells because he had them first. They are senior, or priority rights, and Western water law values those rights above all else. Water regulators can often control water use in a state, but it is a lot harder to take action that limits users with senior rights. Most wells are not pumping their full allocation of two acre-feet, but they one day could, an outcome that would put more stress on the basin. It means “pumping by domestic wells has the potential to be the largest use of groundwater in the basin,” the state engineer wrote. Hafen hopes that the conflict eventually comes to some sort of local resolution. A place where most politicians agree is the order, like it or hate it, only scratches the surface. Republican Assemblyman James Oscarson of Pahrump waits on the Assembly floor on May 19, 2017. Photo by David Calvert. Some ideas to address water use include conservation and the removal of a water-intensive invasive species, the Tamarisk Tree. The county projects that there is enough water for the population to more than double to about 80,000. But several residents said that at some point, the community needed to have an even more serious conversation about growth. On a Tuesday afternoon, after a morning of showers in what has been an otherwise dry year across the West, Gail Darby, a well-owner in Pahrump, addressed the issue underpinning the entire water fight. “We have to slow down until Mother Nature catches up,” she said.